You can check your cronjob's output against a string or pattern now. If it matches the provided string/pattern, we'll send you a notification. 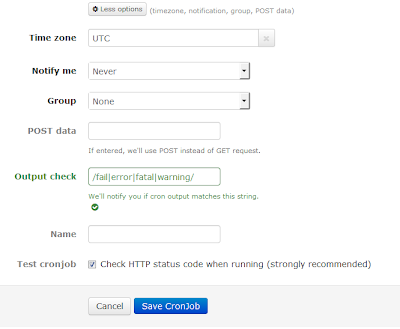 Notify you if your cronjob output contains fail, error, fatal or warning text. Enter anything you want e.g. for Fatal error, we'll notify you if your script prints out some text containing Fatal error. Please note that this is case-insensitive check, e.g. "fatal error", "Fatal Error" or "fAtAl ErRoR" are considered as match. Its format is the same of PHP's preg_match pattern syntax (PCRE syntax). It must starts with / and ends with / (plus modifiers if any). For example, with /fail|error|warning/i, we'll notify you if your script output contains fail, error or warning (the i modifier will make it case-insensitive check). Add a exclamation mark ! before the text or regular expression, we'll notify you if the script output does not match the text/pattern. For example, !success will require SetCronJob notify you if the script output doesn't contain success. If you have any question or suggestion, feel free to let us know by leaving a comment below, or email us. 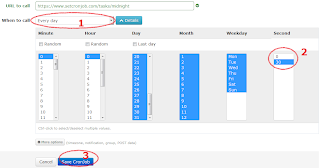 Besides Minute, Hour, Day, Month, Weekday, we've just added a new time field: Second, with selectable values 0 and 30. 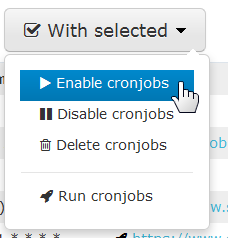 With this new field, you can set up your cronjob to run every 30 seconds (twice a minute). 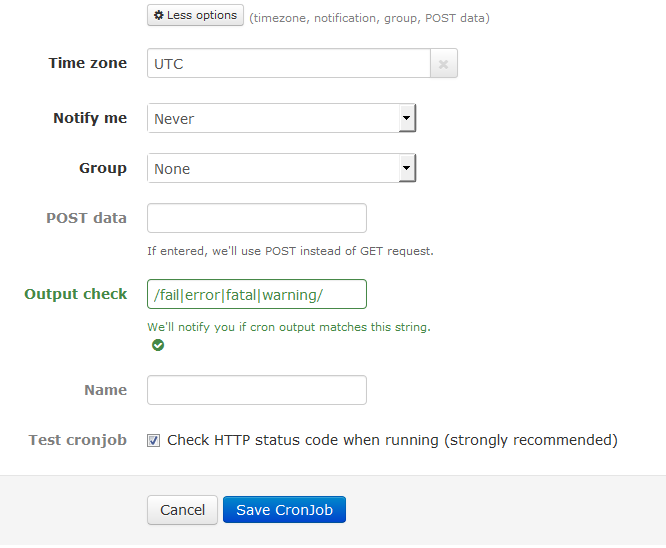 To make your cronjob execute twice a minute, just Edit your cronjob, then select When to call: Every 30 seconds. 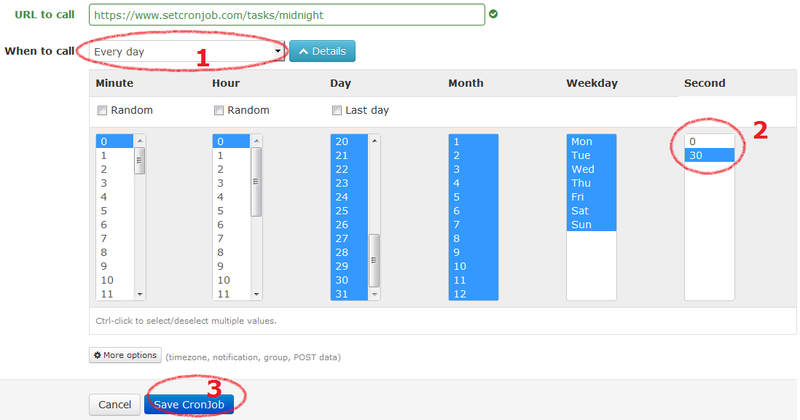 You can also hit Details button and select desired Second values for your new and existing cronjob e.g. make your cronjob execute at midnight,second 30 if necessary. Cronjob every 30 seconds will run 2,880 times a day, so a Silver account can add 1 cronjob every 30 seconds, and a Gold account (with 7200 daily executions) can add 2 cronjobs every 30 seconds. We also offer bigger Gold plan with more daily cron executions, check it out at Billing > My Plans tab. If you have any question or feature suggestion, feel free to comment below or contact us. As an Internet user, you should have at least one social network account e.g. Facebook, Google, Yahoo, Twitter or LinkedIn account. 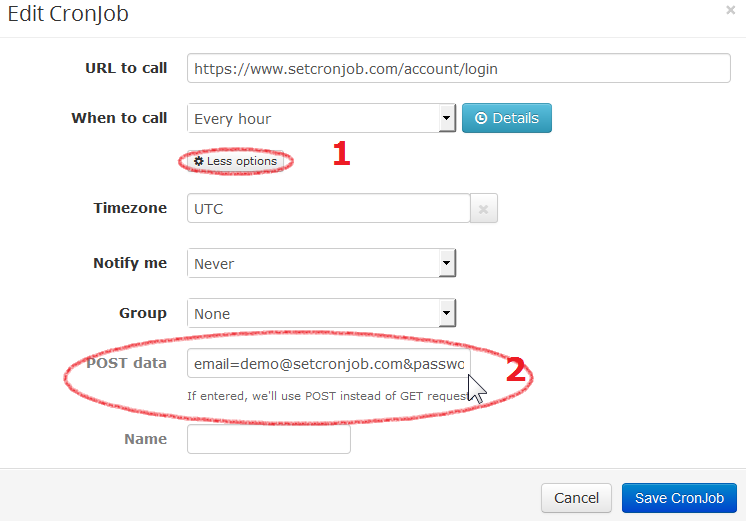 From now on, you can use that social media account to register or login to SetCronJob. Allow SetCronJob to access some data (we'll use only full name and email). If you already have a SetCronJob account, we'll also look up the email provided and log you in to your account. For example, you already registered an account with email john@doe.com, then log in using your Facebook which has that same email address, we'll let you in and connect them. When all details are provided (full name and email address), we'll create an account for you and log you in automatically. We also email the alternative login details (email and lengthy randomly-generated password) to your mail box. 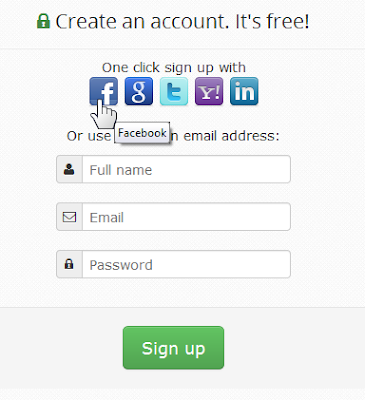 Here you can add more social network accounts to your current SetCronJob account. 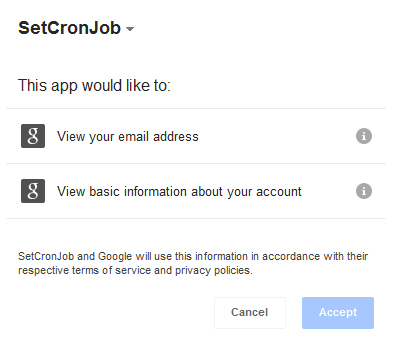 For example, I can freely log in to my SetCronJob account using my Google or LinkedIn account. 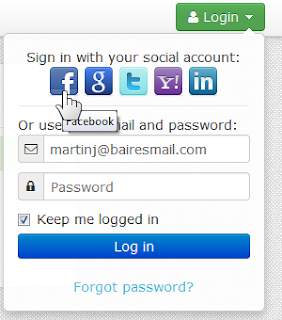 You can also disable some linked social account e.g. I don't want anyone to access my SetCronJob using a logged in Windows Live or Facebook account. To remove a social network account, just unlink it. We won't abuse your social network accounts! The only details we need are just full name and email. We won't post to your social account e.g. Facebook timeline, tweet, status. We may access your friend list under your permission e.g. when you'd like to recommend SetCronJob to your friend; but this feature is not available now. Your social network passwords are obviously protected by your social network websites, we don't have access to it. If you have any question, just let us know. After receiving many feature requests for a public API to create, retrieve, update and delete cronjobs programmatically, we were working hard and finally a REST API has been released. This is our first version of API, and we're open to any feature request, suggestion and feedback. Error reporting is more than welcome! You can read the API documentation here. cron.logs: get your cronjob execution logs. group.list: List all groups under your account. account.edit: Update your account settings, currently we only support changing account's timezone. server.time: Get current SetCronJob server time. server.timezones: List all supported time zones. Gold account: from 7200 requests per day, and it'll be more if your account has more points. Info: The requests counter will reset after exactly 24 hours from the first API request in a day. For example if you send an API request first time today at 8:00AM, requests counter will be reset at 8:00AM tomorrow. Tips: If you're testing it and used up all daily quota, just regenerate a new API key, the requests counter will be reset too. Besides PayPal, now SetCronJob also supports 2Checkout as a payment gateway. They can process all credit and debit cards around the world, including countries which is not supported by PayPal. 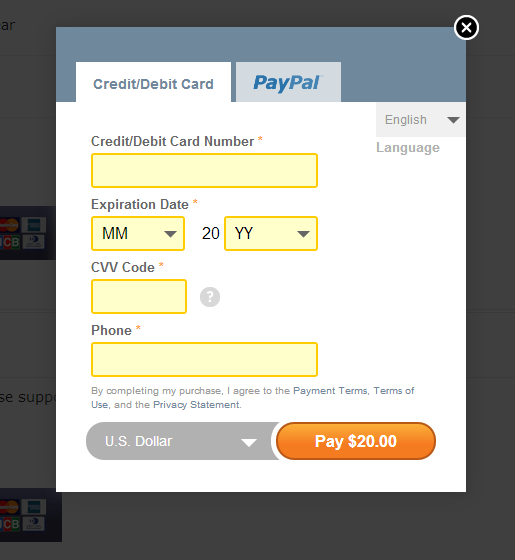 When you're at subscription page, just hit the 2Checkout button, it'll redirect you to 2Checkout to process your payment. 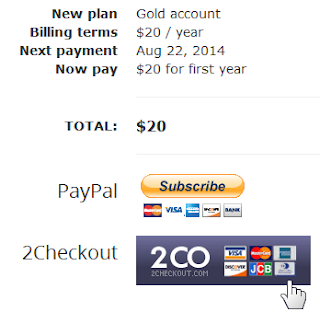 Please note that 2Checkout has their own team to review any payment, so please enter you correct personal and payment info. When the payment is done, it'll take some time around 5 - 60 minutes to be reviewed. Once it passes the 2Checkout review, your payment will be processed and your SetCronJob account will be automatically upgraded. UPDATED on Oct 17, 2013: If your POST data is in JSON format, SetCronJob automatically appends a header Content-Type: application/json to the POST request. SetCronJob is a web based cronjob service, and it works with URL only. By default SetCronJob will make your script execute by sending a GET request to its URL. After receiving many feature requests to POST support, we had considered and finally added POST requests to our cronjob service. If the POST data is empty (by default), SetCronJob will obviously send GET request as usual. You can read more about POST and GET at HTTP Methods: GET vs. POST. Bulk cronjob operations are back! 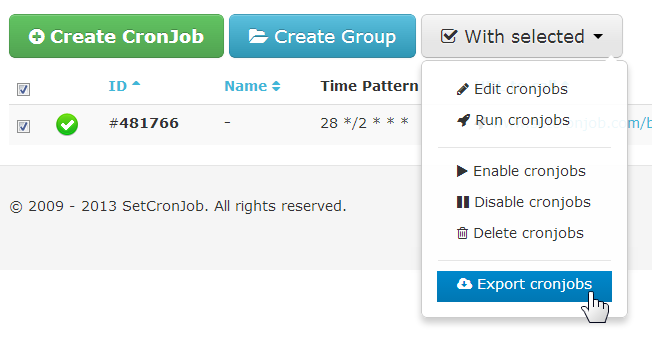 UPDATED on Sep 14, 2013: Batch cronjob editing is now supported. See Bulk cronjob operations section below. 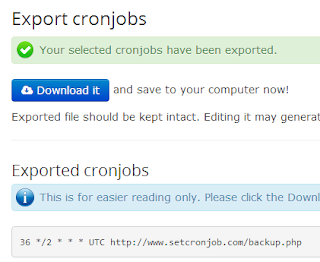 SetCronJob once supported batch cronjob operations last year, but when we upgraded it this feature was temporarily removed. Since there are many requests for this, we just added the feature again, with more improvements. 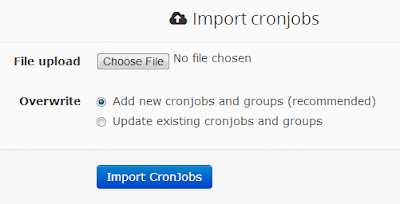 You can select cronjobs one by one, or check the master check box to select/deselect all cronjobs at once. 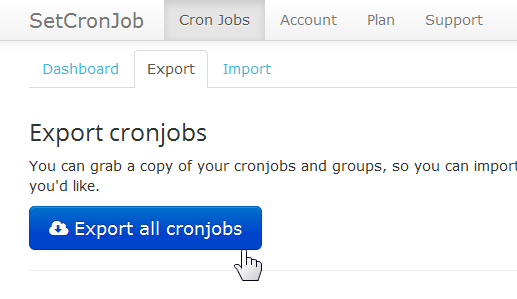 We also support selecting/deselecting all cronjobs under one group, this definitely helps a lot when you want to process or exclude some cronjobs in a group. Just hit check box at group name and it'll check/uncheck all cronjobs under that group. 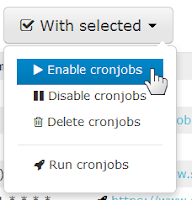 After selecting desired cronjobs, you can enable, disable, delete or run cronjobs manually. More operations may be added in the future. You can also edit bulk cronjobs. SetCronJob supports changing time settings, timezone, notification and group. If you want to leave any setting unchanged, just select "Don't change". All changes will be applied to all selected cronjobs. It's also responsive, so it works in your mobile web browser too. Since May 2012, SetCronJob has supported custom timezone for each cronjob. Once set, your cronjob will be executed under that timezone. As we were using the tz database, the list of time zones is very long and hard to select e.g. there are 147 timezone names for America areas. Therefore we decided to also support the short timezone list from GMT-12 to GMT+12 on top of tz names. This will let you select custom timezone faster and easier. Please note that those timezones are fixed offset to GMT/UTC timezone, so it doesn't support DST. 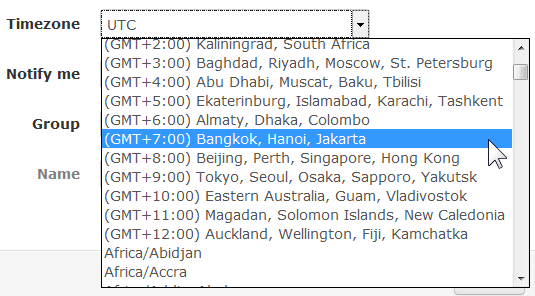 Updated: Now you can search through the timezone list! Updated on Sep 10, 2013: Now we display timezone with their current time offset (with or without DST effect), e.g. America/New_York will be displayed as (UTC-04:00) America/New_York. We also sort the timezone list by their offsets. (in this case, the index file e.g. index.php is the actual cron script). - Some combination of redirections above. For your convenience, SetCronJob will now automatically correct your cronjob URL (after first execution) so it's no longer a problem now. A DNS cache contains entries that translate Internet domain names to IP addresses, for example matching setcronjob.com with 50.116.9.254. Besides system’s DNS cache, SetCronJob has its own DNS cache that each entry’s TTL (time-to-live) is 1 day. Once a domain name is resolved to an IP address, it’ll be kept at SetCronJob’s DNS cache for one day. At the moment, our service has around 100,000 cronjobs, and active cronjobs are executing 1,300,000 times a day. Thanks to our DNS cache, the cron processors just need to resolve 8,500 domain names a day instead of 1.3 million times a day, and that’s saving much server resources. If the cron fails i.e. the old IP address doesn’t respond appropriately with the current request, SetCronJob will refresh the cache entry, trying to get the new IP address. If the cron is still fine, the IP address will be updated next day. To force SetCronJob refresh any DNS cache for any domain name, just Edit then Save one cronjob with that domain name. If there’s something unclear, feel free to comment below, or email me.